We all get enlightened ideas, and creative innovative challenges popping up in our minds while being at ease. Not feeling the stress from everyday life, as i.e. being on vacation. The emerging information shadow of intelligent things, combined with our social fabric will change the perception of everyday life. Augmented Reality has changed the way we look at real things, and get new lenses. Hyped to far reaching crescendos, but still in its fancy! Stepping back into more useful challenges, we realise that the apps we are about to try out do reflect more common grounds, such as shopping helpers to do well informed choices based upon both referral social constructs, as well as pricing and location angles. The lack of connectivity, due to stupid roaming deals amongst telecom operators. While at home, you use your mobile device daily to look-up things relevant to where you are, and what you are up to at the moment. Held back by costly data-traffic deals, you feel held back by the opportunity to be connected as a tourist. Trying to locate a WiFi hotspot….. Why can’t one buy a travel-pack from your telecom operator to a specific destination? 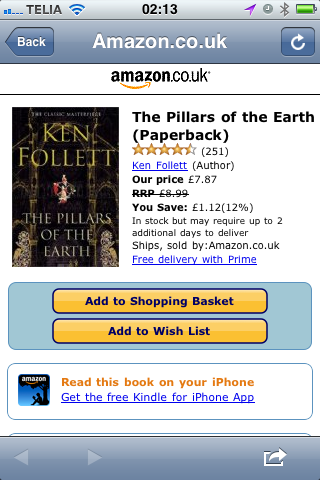 I would be happy to pay a fixed price for the ease of use…. Shopping, as a nice treat when being a tourist! Ask my wife 😉 How do one compare the things available in the local setting with a global networked manner, to do well informed choices? Web Squared do hold several options, to bridge smart things and places with mobile devices and the Net with its ever-growing social scene. Who wouldn’t be happy to raise a question about a shopping choice, and get advise from both comparison services and friends! With all emerging web services, and mobile devices and smart things we have now a scent of what will become a reality sooner than later. Given that I am ‘trigger happy’ when it comes to early adapter of technology, I recall one of my first mobile video encounters, sharing my experience from Milano at the Dome with the family. Crappy lo-fidelity and high-cost! Second, my first cracked iPhone that my beloved kids nicked at pool site in Turkey viewing YouTube clips from Donald Duck. The result a phone bill from hell. Lastly a recent real scenario: my wife finds a very nice product on site in Sicily, and I realise that I would like to compare both local and other on-line options to compare the product at hand. Challenged by the in-built constraints with both expensive mobile data price models, and a less coherent and seamless, easy to use service pack. My mind started to wander, if this wouldn’t be a perfect mashup social and networked business model? 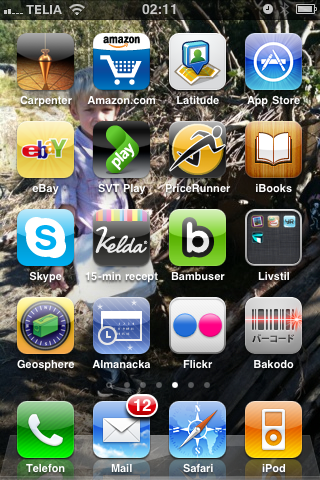 In its simplest incarnation, a bar code scanning app for the iPhone and an SMS-service, while being abroad. At home with fixed mobile data cost, a more seamless app with connections to Google Product Search and social consumer networks. Coming back to work reading my flooded reader-feed finding a on-spot article, I started to use an app called Bakodo (bar code in Jap. ), and it works 😉 Well it have obvious drawbacks given that it still is mainly focused on US, and do not hold a good back-end data raw material. 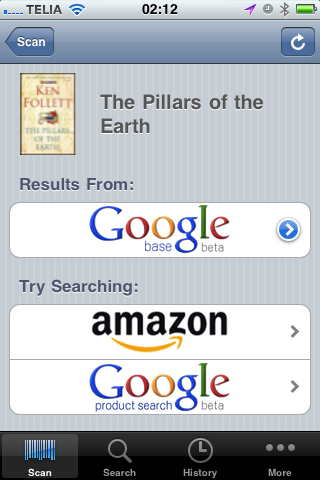 I used my summer reading, Pillars of the Earth and got a quick response. 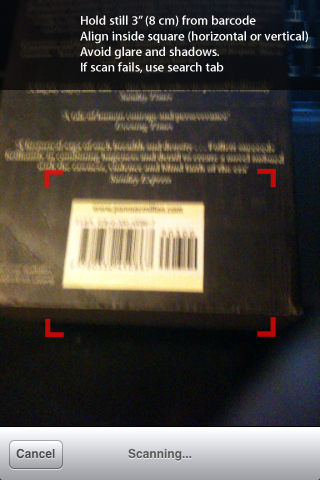 Other bar codes didn’t match due to the constraints of raw data in the information shadow. Building a Cathedral takes craftsmanship, time, resources and effort, given the book I read, and the same goes for the information shadow. Similar, experience with Foursquare, WikiMe and several other location based thingy’s that I use daily. I am thrilled about how this set of services, apps and uses will meld into seamless everyday solutions. The mashup economy, and future business networks will strengthen the consumers and improve the services, and product we use daily. Buying groceries and get detailed information about how sustainable choices you make daily, to well advised choices being in travel mode. Our kids take this for granted, and my son (8yrs) who is a knowledge seeker, do expect my iPhone with all the apps, provide him with timely and well-matched knowledge discoveries(i.e. 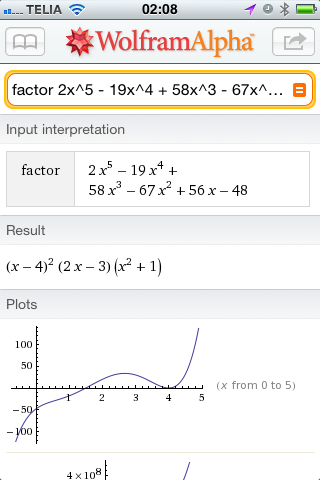 Wolfram Alpha my most expensive app). Drop any subject, and you will get the information handy to answer your kids. This entry was posted on Tuesday, August 17th, 2010 at 12:23 am and is filed under emerging technologies, Open Innovation, social networks, Uncategorized, web squared. You can follow any responses to this entry through the RSS 2.0 feed. You can leave a response, or trackback from your own site. Interesting post. I fully share the view regarding telcos roaming schemes that obstruct the development of websquared apps to its full potential. Wolfram Alpha was new to me. An even better info seeking app would be a mix of Wolfram and Aardvark (vark.com). I love findability, something that goes across all things I work with, in research and practice. Things you can’t find is of no use 😉 Wolfram Alpha is a cool thingy but pretty difficult to use, given that I don’t have the brilliant talent to produce thought through questions….I have been engaged in the development community since it’s launch and see several cross over space in information seeking where Aardvark, Wolfram Alpha and several other means will mashup up the knowledge discovery journey. In my work, where I do research the emerging uses and technologies where gigants like Google and MS/Bing try to capture context awareness and social search I really get happy. We all need filters, and in this scene the context aware apps (such the one in our brilliant mobile devices) and our social behaviour in conjunction with traditional information management will be of great help. I think Peter Morvilles recent book and blog around http://www.searchpatterns.org is illuminating, where we get Ambient Findability. Outstanding question to the Telecom operators, WHY they don’t embrace open innovation and let their obsolete business models die! In this space Google and Apple do act as oxomoronic challengers. Where the first embrace open innovation through their Android movement and becoming a Telecom operator, second Apple the most closed company on earth with only one ambition ‘simplicity’: which have led them into the ‘hot spot’ of a business vertical where they own us users all through the value chain. A place that all Telecom operators would love to be in…. sadly they have lost that battle long time ago. I read about the recent move from Vodafone with pre-installed apps on their Android devices….. this is as stupid as looking in us into their early ‘mobile internet portal’ of NO USE!!! I really hope that web squared will become the next phase… with pragmatic work arounds and new business models.